Maci is a 6-year old little girl who developed growth and life-threatening adrenal gland suppression from the aggressive use of corticosteroids to treat allergy and asthma. Over a period of 18 months during which she had infrequent follow-up office visits, her asthma specialist gave her higher-than-recommended doses of both inhaled and intranasal corticosteroids, for longer-than-recommended periods of time without dose reduction, and she developed dramatic changes in physical appearance from systemic side effects. The parents noticed the changes within a few months and told numerous health care practitioners, including pediatric asthma specialists, who were adamant that Maci’s physical changes were related to genetics, diet and exercise, and were NOT corticosteroid-related. Maci herself was helpless and could not tell anyone that she was having a medication side effect, instead depending on the education and experience of health care practitioners to recognize and treat her condition. After returning from a trip to Disney, during which Maci nearly died from an infection, her Mother Kristen decided to take matters into her own hands. She educated herself using the internet and sought the help of two experts. 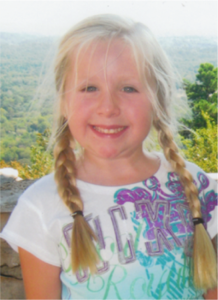 The first was an adrenal gland expert (pediatric endocrinologist), who diagnosed adrenal gland failure, but who also was reluctant to implicate the corticosteroids as the cause.Therefore, her parents were left to believe that Maci’s adrenal glands had failed from natural causes and that she would die without an adrenal gland. The second expert, who was proficient in corticosteroid safety, assured her that the side effects WERE corticosteroid-related and that the adrenal glands WOULD recover and side effects WOULD disappear after the corticosteroids were gradually withdrawn. Thankfully, that was the case and Maci is now a happier and healthier child. But, she still suffers from the residual effects of corticosteroids, since she has osteopenia, has had multiple severe bone fractures following minor trauma, and receives growth hormone.So, what went wrong in Maci’s case? The health care system failed to deliver high quality care to Maci at multiple levels. Maci’s healthcare team, including specialists, did not follow FDA and asthma guideline recommendations for corticosteroid dosing, nor did they recognize systemic side effects of inhaled and intranasal corticosteroids. They also didn’t tell Maci’s Mother about the need for mouth rinsing after using inhaled corticosteroids, to eliminate unnecessary corticosteroid that would otherwise get swallowed and absorbed (only the corticosteroid that stays in the air and travels into the lung during an inhalation is helpful for the asthma). They also didn’t respond to Maci’s Mothers concerns and assertions that the corticosteroids were causing the side effects. Also, her mother gave her all of the doses prescribed by her doctors, which is the right thing to do, but which is not typical. If the health care team had made at least one of the above decisions better, it could have prevented Maci from developing corticosteroid side effects. Is Macy’s case an example of a rare “perfect storm” of corticosteroids or does it represent the tip of an iceberg? Surveys of Asthma Specialists and Non-specialists reveal that while highly trained, many still do not feel confident in there ability to dose properly and spot side effects. 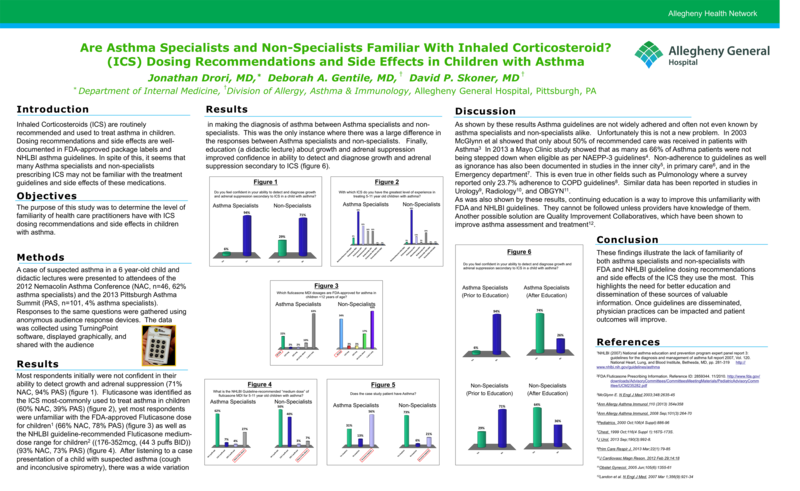 CLICK HERE to view a graph summarizing a case study of Asthma Specialists and Non-specialists and their familiarity with Inhaled Corticosteroids dosing recommendations and side effects. At Maci’s TEAMS we encourage healthcare professionals to balance the safety and efficacy of ICS treatments in children. Make safety a priority, especially if pre-pubertal, mild disease, also using INS, high adherence. Choose ICS with the best safety profile, lowest systemic activity, at least one negative robust growth study (per FDA guidance), and FDA approval for children! Be proactive and have a safety discussion with parent. We encourage you to check the dosing information our medications page.